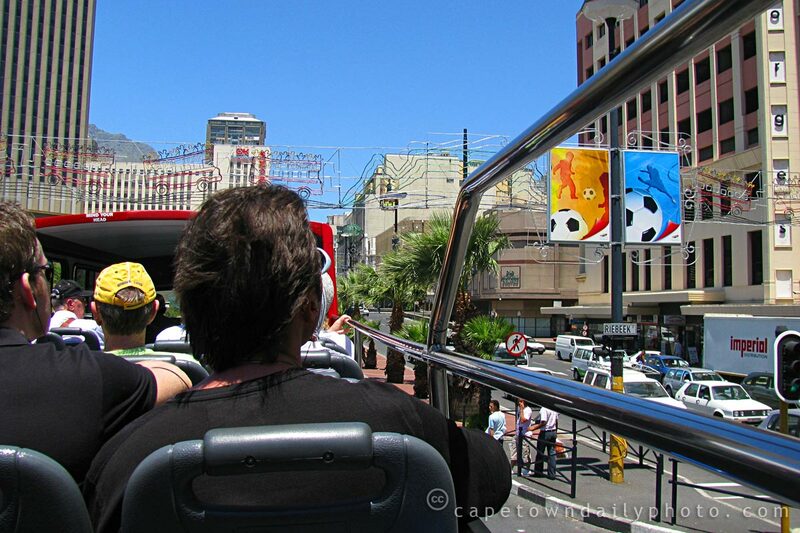 We've wanted to do Cape Town's open-top bus tour for months, perhaps even years. The arrival of our niece and nephew from Sydney was apparently the motivation that we needed. We caught the bus at the V&A Waterfront (just outside of the aquarium) and went as far as the Kirstenbosch Botanical Gardens on the first leg of our tour. There we paid the R32 (per person) entrance fee, found a grassy spot (as if perfectly manicured lawn was difficult to find :)) and hauled out our picnic lunch. I'll write about the gardens some other time, but just to put you in the picture, we watched ducklings waddle across the lawn, turtles duck into ponds (and come rushing back after us when we left), and baby guinea fowl trying desperately to keep up with their mom. We caught the next City Sightseeing bus from Kirstenbosch over to Hout Bay and then along the coast past Llandudno, Camps Bay and Sea Point, before heading back to the V&A Waterfront. Posted in General on Tuesday, 9 December, 2008 by Paul.